Today was day 1 of my massive freezer cooking session. I’m making 2 months worth of freezer meals for Dad and Daughter Person while I’m traveling for work for 5 weeks. Today’s task was to get all of the ingredients. 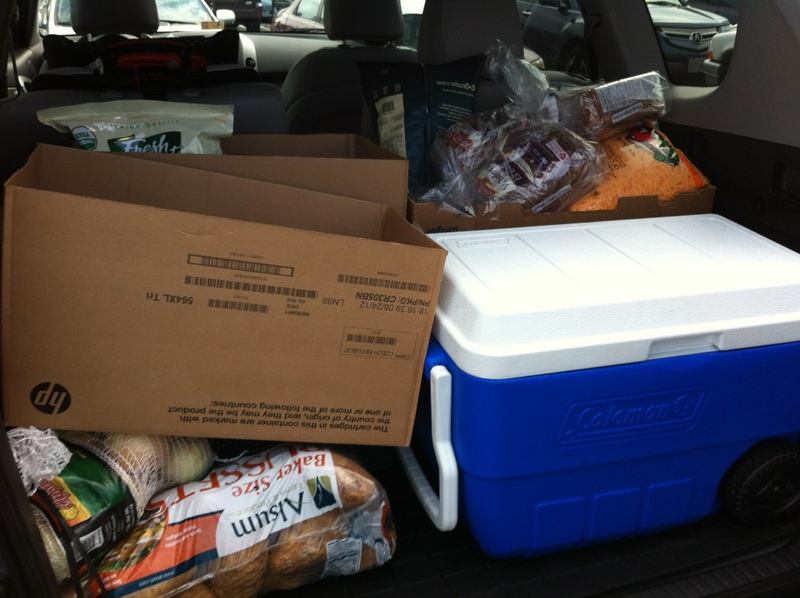 I made a trip to Costco ($512 even), Wal-Mart ($143.32) and Whole Foods ($173.43) – there was quite a bit of wine purchased at Whole Foods and Costco (about $150 between the two of them), as well as some stocking up because they had coupons (like garbage bags and tooth paste) – so the totals were not all the food. I’d like to figure out the cost of each serving if I get the chance, so stay tuned for that information. 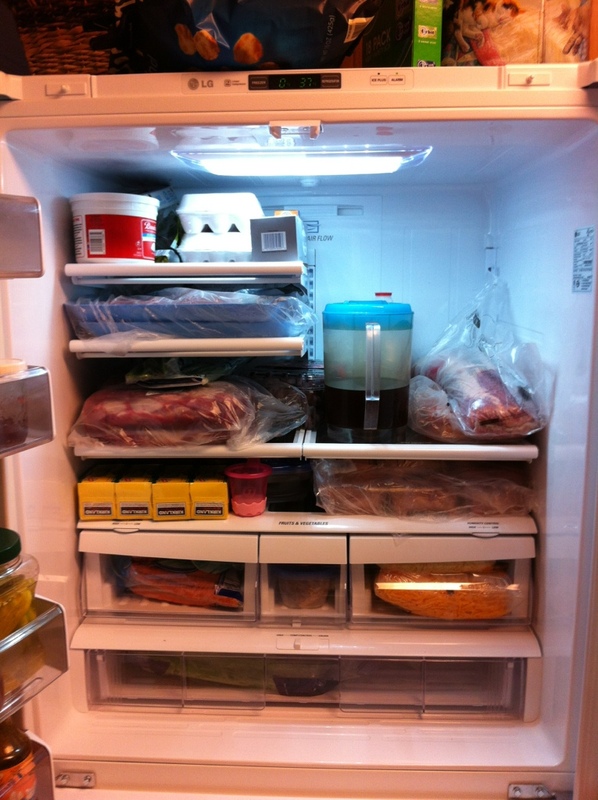 And the fridge after it was stuffed. This is a 26 ft^3 fridge, so it’s no small fridge. Every drawer is stuffed with costco purchases. 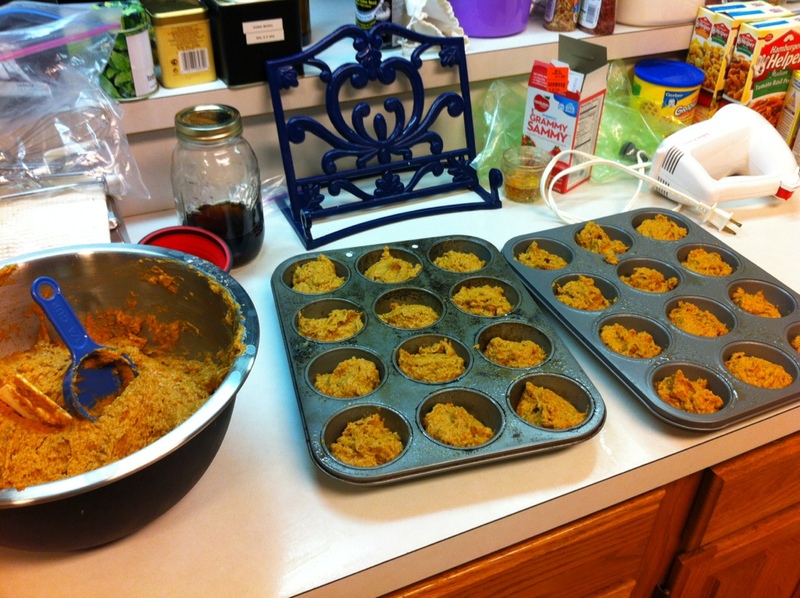 We also made pumpkin muffins for Daughter Person’s breakfast. She likes muffins, so we thought this would be good. I had to get out the hand mixer, which I’ve used once in the last four years (today) because the batter for the pumpkin muffins needed to use the *big* mixing bowl. Gave us 3 1/2 dozen muffins though. Finally, we made butternut squash lasagna – one large 9×13 dish (hard to make lasagna noodles smaller than they are). During all of this, I made the chicken with tarragon vinegar sauce for dinner (and leftovers tomorrow and the next night). Tomorrow, I need to take the burritos and put them in freezer bags, print the labels for everything we did today, and start on the next set of prep work. I hate halving chicken breasts, so Dad is going to do that part for me when he gets home tomorrow night. I’m going to put together the fish dishes, and probably the side dishes. Lots and lots of potatoes to peel and onions to chop tomorrow! 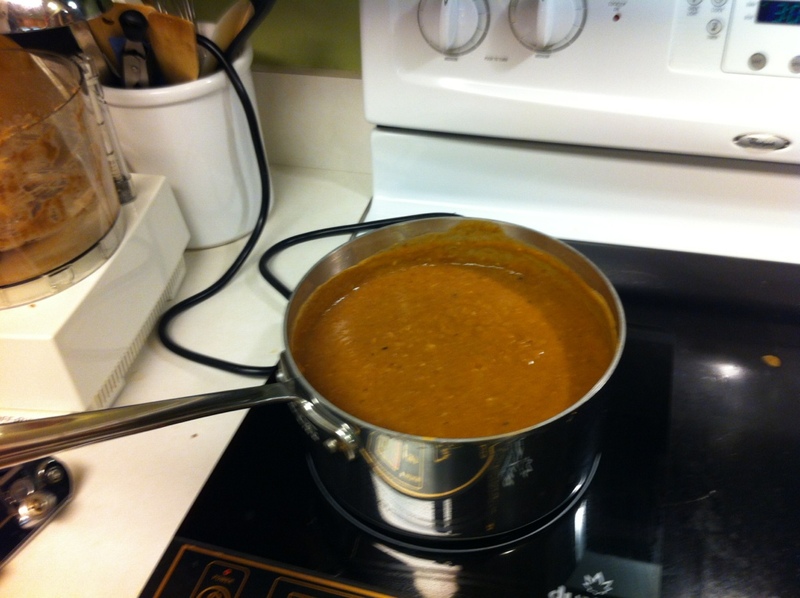 This entry was posted in Cooking, Finances and tagged Freezer cooking on September 4, 2012 by Mom. Wow, I’m totally impressed…that’s a lot of cooking! Will you be posting any of the recipes? The calypso chicken and the cherry skillet chicken sound interesting. Unfortunately, most of the recipes are from cookbooks and copyrighted, so I don’t feel right posting them on my blog. I went back and edited the post to link to the recipes where they’re available online, and to the books (at Amazon) for those recipes from the cookbooks. I really can’t rave enough about “Fix, Freeze, Feast”, we’ve liked every single recipe we’ve tried from there.